When you’re starting out with Answer Bot, it can be difficult to know how to prepare for and use the feature in the best way possible. In this article, we’ve included four things you can do before, and shortly after, implementing Answer Bot, that can set you up for success. For a list of all Answer Bot-related documentation, see Answer Bot resources. In many cases, we find that customers haven’t done enough prep work before they start wanting to use Answer Bot. One key step you can take is to take audit your recent tickets -- maybe from the previous week -- to find tickets where customers really could have self-solved their problem. Review tickets where a macro was used to solve the problem in one touch. Could there be an article for this? Go write that article. Review common tickets that were just answered in one touch: Could there be an article for those that would have allowed customers to self-solve? Go write that article. You’re a game developer supporting iOS and Android platforms. You have two channels for incoming tickets: one for iOS issues and one for Android. Using trigger conditions, you can create two Answer Bot triggers, one for each channel. Then you can use article labels to serve up only iOS or Android articles where they make sense. Your customers may be more varied than that, so stop for a second and really think about how you can best segment them, and create useful conditions around them. Then, you can serve them the best articles possible. It almost goes without saying, but if you don’t put gas in the car, the car isn’t going anywhere. The Answer Bot placeholders are a key part of the feature. They determine how suggested articles are displayed in the responses sent to your end users. We’ve built all the key data points into Insights to allow you to really monitor, report, and slice away at your tickets and their deflection data. There is so much you can learn if you spend the time building a few reports (or just digging into the default ones). Will there eventually be an option to exclude certain articles using labels instead of just include them? We have several years of weekly release notes as help articles that are drowning out other useful suggested answers, it would be ideal to just add a "releasenotes" tag to all of them to be ignored, instead, I have to go to every single one of our other articles and label them "notreleasenotes". Excluding entire categories or sections would be even better. I spoke to Mike about this and was able to confirm that we're not currently planning on adding any blacklisting functionality to the AnswerBot. However, that doesn't mean we wouldn't consider it in the future. I looked for a similar suggestion in our feedback forum but wasn't able to find anything. I'd definitely recommend that you hop over there to share your idea and detailed use case. Then other customers can vote for your suggestion and share their own use cases, and our Product Managers will see it as well. This article says the deflection tab would be added to insights 48 hours after this is turned on. I have the deflection tab in my insights, but the feature has not been turned on. The data within the Insights deflection tab is generated based on use of Answer Bot within triggers. What this means is that in order to get data on Answer Bot, you will need to modify some of your notification triggers to include Answer Bot placeholders. You can find information on how to implement Answer Bot into your triggers through its Setup article, under the 'Creating or Modifying triggers to include Answer Bot' section. Once you have these triggers setup properly, you will begin receiving data as those links get used. I hope this gets you in the right direction, let me know if you have any other questions! In the "write the right articles" section, I'm interested in how you recommend people actually do your suggestions, particularly the 2nd one. I've yet to find a view where you can see and analyze one touch tickets. Haven't gotten any suggestions from Support either. Thanks in advance. Hi Erika, if you are familiar with Insights (Zendesk reporting tool) you should be able to create a report that lists tickets that have been solved using only one comment update. HOW: Shows Ticket id and Ticket Subject. You can click the ticket id to open any ticket in the list. FILTER: limits list to tickets that have been created this month and has less than 3 updates and have at least one public comment (don't know if the initial comment by the requester counts, if it does this filter is redundant). This should get you started with analyzing which tickets are solved by one message. How can we use article labels to segment what gets sent to users via Answer Bot? 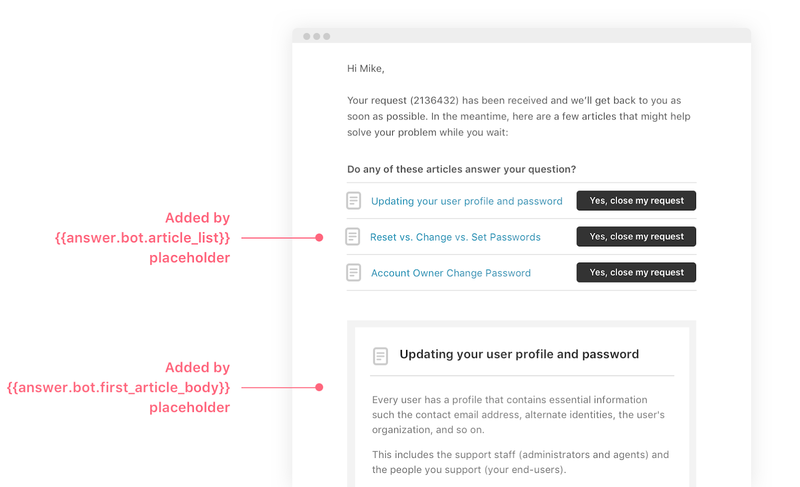 Scenario: We restrict Guide Content through Organizations and tags (based on user field values), and are worried that Answer Bot may send article links to users who can't access them. Answer Bot checks user permissions before suggesting an article so you should not run into the problem of an end-user being suggested an article they do not have access to. As long as you've set up the restrictions on your articles as outlined in this article you should be good to go! Is there a way to make certain articles more likely to be selected as a response by answer bot in response to a specific question? For example, a customer asked a general question related to "categories". We have several articles about categories and the bot selected responses that were very specific, but didn't pick the overview article which would have been most useful. As another example, if ever anyone mentions "training" we'd like them to be suggested a specific article about Training. Is there anything we can do to make this happen? Labels? Or do we need to keep telling the bot that it's answers are not correct, until it finds the one we want? +1 We'd love the ability to suggest articles to answer bot in the ticket. Perhaps this could be woven into Knowledge Capture? Is there a way to add tags to the tickets solved by answerbot depending on the article that solved the customers request? For instance, if a customer asks about what countries we ship to, and answerbot delivers and solves that question with the relevant knowledgebase article, can we have the tag "shipping" added to ticket? We use the tagging system extensively as a way to monitor trends in customer questions and update our provided materials, and would have to manually go through the solved answerbot tickets to add in the tags manually if this is not possible. Customer writes a couple paragraphs of text into the ticket. The actual problem or question is at the bottom of the text (not at the top). When they ask the question it may represent the actual problem but also may not. I'm assuming Answer Bot is not reading all that text and tries to determine article matches by the subject and start of the information they have typed. Is there a way, when the ticket is first looked at, for the Support Agent to write in the actual question or problem so Answer Bot can try to find a better match based on correcting the problem/question? Seems that would help the customer write more targeted questions and also enable AB to find the right article. But I get the feeling it's too long. At the same time, if I broke this down to have "Guild statues" as a separate article and did something similar for the rest we would have too much content in the Guilds and events section. 1. I do not see a Deflections tab as described above. What is needed to see that? 2. We are not seeing great results with Answer Bot (1.9% - Level 1 Support & 0.4% - Level 2/3 Support resolve rate). But, for the 1.9% --> we are seeing a click-thru-rate of 45%. For the 0.4% --> we are seeing a click-thru-rate of 11%. We would like to get the resolve rate up to at least 10%. How can we do this?